Hi! I am Anson, a Biological Sciences (Zoology) student studying at the University of Birmingham. For some reasons, anything about aquatic life could always catch my attention, therefore, once I noticed that there is internship available in HKDCS, I instantly applied without hesitation, and I am glad that I had joined them during summer. The amount of knowledge I have gained through this internship has surpassed my expectation. I strongly recommended this internship to you if you have any interest in marine mammals. I’m certain that you will not regret it. You will able to learn different survey skills, knowledge on marine biology especially cetacean and conservation on Hong Kong. 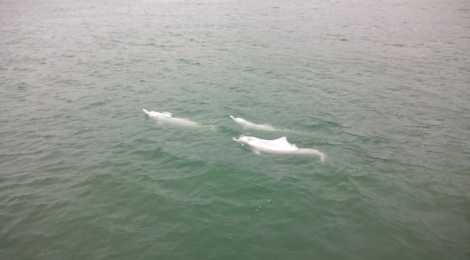 People generally know about Chinese white dolphins as being a ‘symbol of reunification’, and that they are currently under threats. But when people really think about them, most people will never link them with local extinction. After starting this internship, I was able to see directly just how vulnerable they are. If we do not take any action, then they could really face extinct. In Sri Lanka, one of their population of indo-pacific humpbacked dolphins has already dropped to only 4 individuals. Our local population have decreased from 158 individuals in 2003 to only 65 in 2015. There is now a real chance that our population will have a similar fate as the Sri Lanka population. There were many precious moments in this internship that I would hardly have a chance to experience again in the future. Sometimes if we are lucky enough, our vessels would be surrounded by playful dolphins socialising. Or sometimes, when we saw a grey, tiny shadow right behind a pink dolphin, you know that you just manage to spot a juvenile. I’m sure you will fall in love with them once you saw them in the ocean. Given the fact that our dolphins are under so many threats, these joyful experiences would only be less and less likely to occur, that make you treasured every moment you have with them. In this internship, there are different surveys I had participated in. Firstly, was the vessel survey, which is basically line transect running by boat. This surely was my favourite survey as you can see dolphins in the closest possible distance, in which I had the chances to observe different behaviours performed by them, sometimes they will just surface a bit and then disappeared, but if we were lucky enough, we could see lots of dolphins (Usually around group of 5) socializing, hunting and performed their most natural behaviours. It’s then I could actually realise what a magnificent and mysterious species they are. Another part of the surveys I had participated in were the two Land-based surveys. One was the Sum Wat survey and the other one was the Tai-O land-based survey. 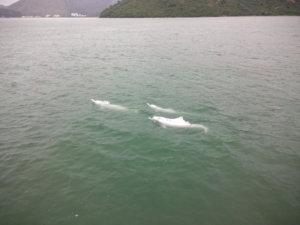 In Tai-O, there are dolphin watching boats called ‘Walla-Walla’, which don’t always, actually nearly never follow the dolphin watching guide set by the AFCD, and our Tai-O survey was aimed to monitor how they behave when approaching dolphins. What we saw is that they show no respect to dolphins, and don’t care about the life of them. When they manage to sight a dolphin, they will always approach that dolphin at full speed. Our team once saw a Walla-Walla passed straight through a spot which a dolphin just surfaces literally a second ago. There were many dolphins that were harmed by them, so if you go to Tai O, never join those boat trip or else you will one of the accomplice. For Sum Wat survey, it’s actually quite different from the Tai-O survey, in this survey we were aimed to observe the activities of construction boat and how they affect dolphins. In the first two months of our survey, we virtually saw no dolphins, probably because there was a high level of construction boat activities. Surprisingly, we saw a group of dolphins passing through the bridge in my last survey. I was so thankful and treated it as a farewell from them, but if the third runway does start the construction, I’m sure they will left again. If you expected to see dolphins every day and living happily by joining this internship, I’m afraid you would be disappointed. Thinking back the first day I went on board, the first thing I saw isn’t a dolphin, instead, it’s the Hong Kong Zhuhai Macau Bridge. I was shocked, surely you would have heard a lot about the construction and how it affects dolphins, but seeing the real thing is a totally different experience. You can see the bridge cut straight through Western Lantau and North-west Lantau, also seeing the enormous amount of construction boats, high-speed ferries and fishing boats pass through the area. At that moment I just could not believe there could be dolphins living such a crowded area. But suddenly, a dolphin will surface, or even socialising in groups. That is the kind of environment where our dolphins are struggling to survive. 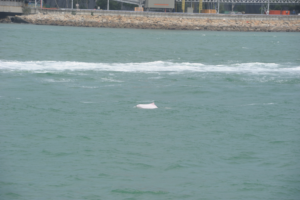 Dolphins in Hong Kong were living so close to us, and surely there will be conflicts between the two species. Our natural resources are limited, once we destruct it, there will be no return. That’s why, as a developed country, we should start to rethink which kind of developments we should choose in order to take a balance between environment and development.